Should You Eat The Widowmaker Burger? The Answer May Surprise You. Okay, I'll let the cat out of the bag. Unless you're 14 and have hollow legs, probably not -- unless you have a friend to help. The Widowmaker is just one of several options available at Perryville's relatively new downtown stop. Mustang Sally's opened two years ago, and it's starting to cultivate a following. Housed in the building that was once home to Rankin's Cafe, the yellow exterior belies a thoroughly updated interior with plenty of booths and tables for gatherings. There's even an ample counter to sit at... which we did on this particular trip. a note to dine there again next time I was in town. Can You Tame The Widow Maker? Saddle Up and Take Your Taste Buds for a Ride. In the legendary Old West, a widow maker referred to a very unruly horse, also called an "outlaw," or one that cannot be tamed to ride. 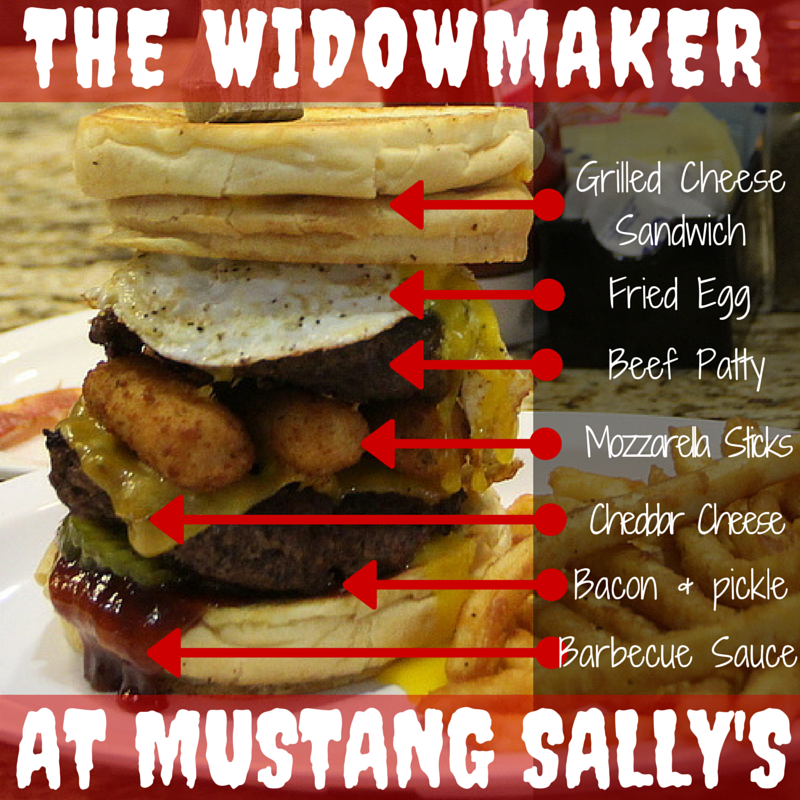 At Mustang Sally's, our Widow Maker features Two Mustang Sally Burger Patties – with a layer of Mozzarella Sticks between them, dressed to kill with Bacon, Cheddar and American Cheeses, Pickles, BBQ Sauce and a Fried Egg all stuffed between Two Grilled Cheeses. Please allow 25 minutes for preparation and plenty of room in your belly for consumption. We both wondered who'd take on something like that for a few minutes, before it dawned on us. We'd do it. Of course we would. After all, we'd already conquered the Excaliburger and shared the Five Pound Cheeseburger (with others) -- this would feed both of us and give us a story as well. So we ordered it. And we waited. We knew we'd need to wait, so that wasn't an issue at all. We sipped our drinks, caught up on Facebook, checked messages. And then here it came. burger, and the whole thing smelled like a carnival. So, how'd it taste? Well, Grav's the better judge of that. He managed to smash down the sandwich and unhinge his jaw enough to get a bite in that included everything between those two grilled cheese sandwiches. And he pronounced it good. Me? I wasn't crazy. I ate mine with a fork. I loved the mozzarella cheese sticks, though I felt guilty the entire time we were dining. The egg was a bit salty, but that was likely just a little seasoning error in the kitchen. The barbecue sauce worked with it. We didn't finish it all -- I know, you're disappointed, but dang it that's two half pound patties, two grilled cheese sandwiches... that's a ridiculous amount of food. But we can say we've done it now and we have a good story to share. two. I mean, if you're going to be audacious, be audacious. Still, if you think about it, you're getting the equivalent of two burgers with bacon and extra cheese and half an order of mozzarella sticks. That's not bad. I should also mention... the produce at Mustang Sally's comes from Heifer Ranch up the road and from Van Dalsem Farms... when it's in season. Next time I go, I'm getting the cheeseburger sliders with the Mustang sauce, jack cheese and fried onion strings. Next time you go, let me know and I might go with you. Ok so my husband's deer lease is in Perryville and he eats here a lot. I may have to tag along just for lunch oportunities. 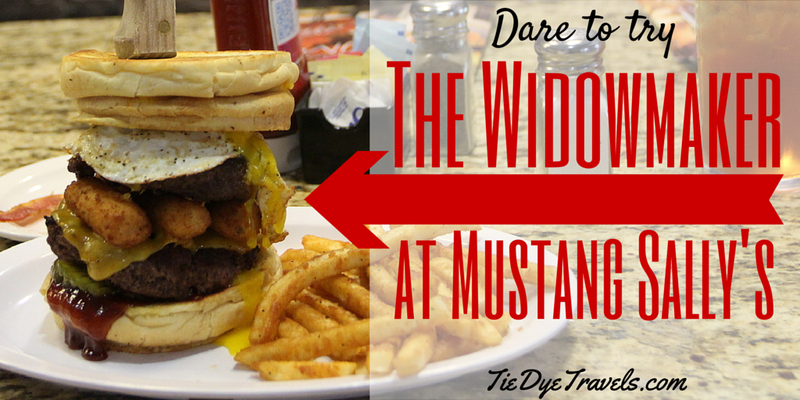 I bet my husband and I would try the Widowmaker just to be weird! I would probably be like you and eat it with a fork.